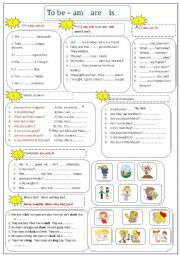 There are 6 task - vocabulary, grammar and listening task. 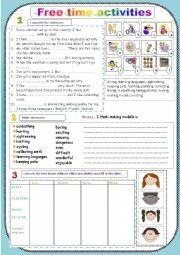 Pupils train vocabulary on the topic, repeat Present Simple,learn verbs after which it needs to use -ing forms, examine the difference between too - either. Write words into the right order to make sentences and match them to the pictures. 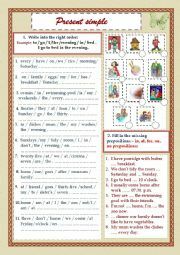 Fill in the missing prepositions. There are 5 tasks here - spelling, verb to be and have got, numerals and plural of nouns, short answers. 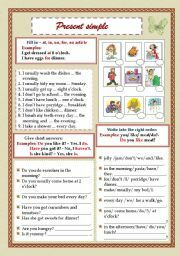 There are 7 exercises here to review a verb. 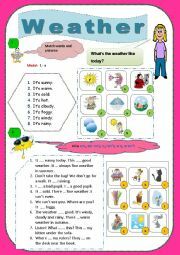 Children fill in am, are, is, match sentences, give short answers, complete the sentences according to the pictures. At the last task they should guess - Who is this? 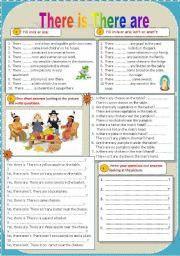 There are 5 tasks here, where it�s necessary to fill in missing words, write correct forms of adjectives, correct the mistakes. There are 4 tasks in this paper. Pupils have a possibility to train this structure in various exercises. 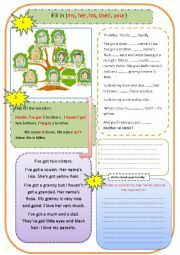 There are three tasks here, where pupils should fill in missing pronouns, correct mistakes and write about their families. 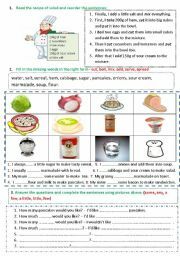 There are three tasks here - reorder sentences with instructions for making salad, fill in the missing verbs in the right form of Present Simple, complete questions (how much/how many)using pictures. Funny way to learn prepositions and repeat vocabulary on the topic Furniture. 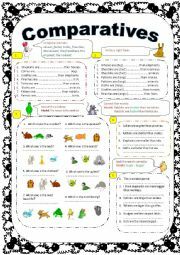 Pupils make a choice among verbs and click a right form! Funny way to revise words on the topic. Pupils learn words on the topic (rooms) and make a choice between two forms of the verb to be_ is or are. Game to train grammar structure of positive, negative and interrogative sentences with keys and pictures. 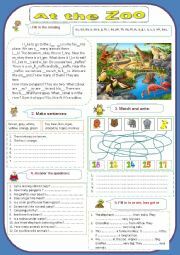 A task with a multiple choice of farm animals. Pupils repeat words on the topic and train colours. Funny way to check pupil�s knowledge about different types of books. There is a description of a book,it�s necessary to make a right choice among some books. Food (we drink and eat) What do you like or don�t like? Children learn new vocabulary matching pictures and words.It�s funny and cute!